The earths rotation slows due to the pull of the moon’s gravity on the tidal bulges. If the same side of the earth always faced the moon, then the tidal bulge would look like the figure on the left, but of course much smaller (see here for why the tidal bulge exists). However the rotating earth drags the tidal bulge round as shown in the figure on the right. The moons gravity must therefore exert a slight torque on the earth, trying to twist it in the opposite direction to which it is rotating; which means the earth’s rotation rate gradually decreases. The diagram shows the force on the left bulge trying to slow the rotation down, and the force on the right bulge trying to speed it up; but the force on the left bulge is slightly greater, partly because it is nearer to the moon, and partly due to the angle of the pull. Consequently the earth’s rotation is continually being slowed by a kind of friction between the tidal bulge and the earth. If there was no friction between the tidal bulge and the earth; then the bulge would always point directly towards the moon, and the effect described would not exist. If the moon was joined to the earth by a stick, as above; then the same frictional force that slows the earth, must also exert a force on the moon. 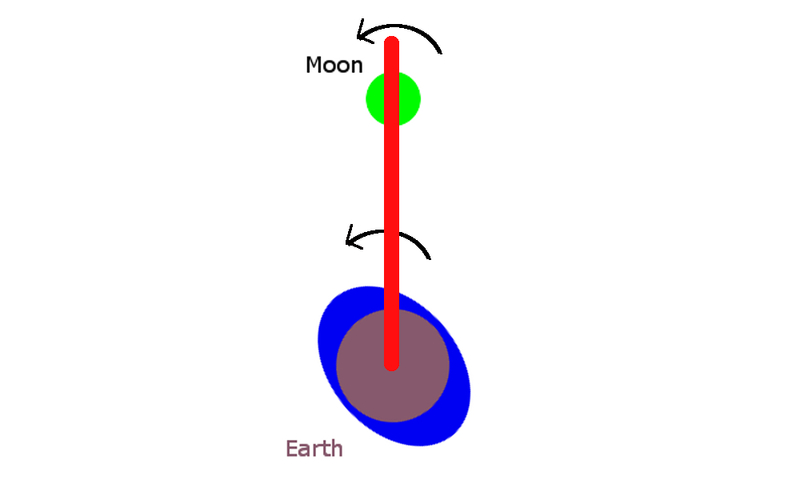 If the moon was free to slide on the stick; then this attempt to accelerate the moon, would tend to slide it along the stick, further from the earth, and this is indeed what happens. Another way to consider what is happening; might be to think that a moon on a circular orbit around a spherical earth, always moves at right angles, as on the left. Whilst a moon orbiting an elliptified planet, has a slight component forcing it to gradually spiral away from the planet, as on the right. 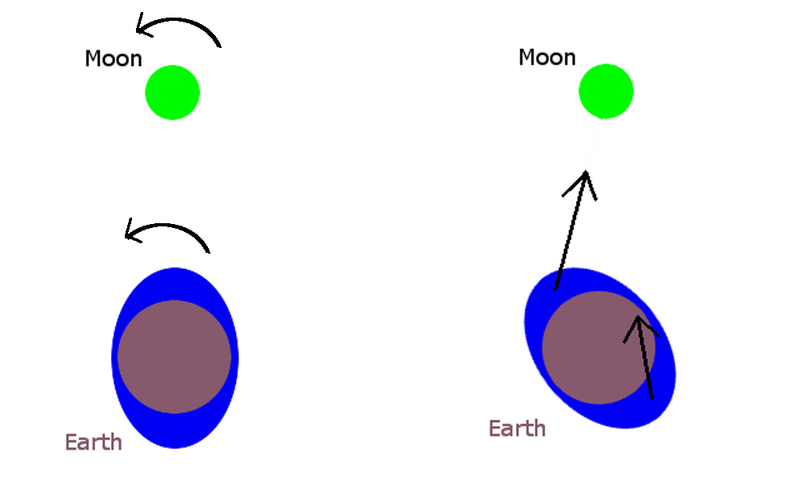 So the interaction between the moons gravity and the earth’s tidal bulge, has the effect of both slowing the earth’s rotation, and forcing the moon to retreat from the earth. I have not provided a very complete description of why these things happen, but it is better than I could find elsewhere, so hopefully it was helpful. Most explanations just mention conservation of angular momentum, and leave it up to the reader to go figure. The earth loses angular momentum as its rotation rate is slowed by the moon; so conservation of angular momentum means that the moon must increase its angular momentum by exactly the amount the earth has lost. This is only happens because the moon is circling the earth in the same direction as the earth rotates. 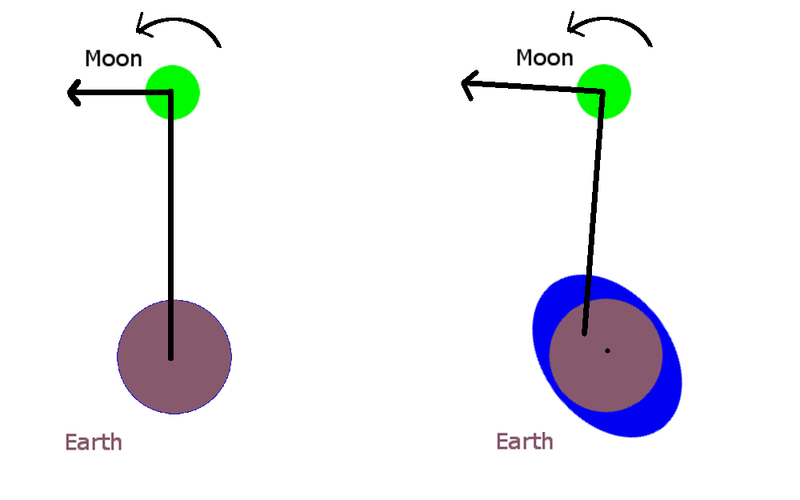 If the moon circled in the opposite direction, as the BBC and their Poppycock woman believed; then the moon would still slow the earth’s rotation, but it would gradually approach the earth rather than recede, resulting in larger tides, producing a positive feedback which would ultimately lead to the earth and moon colliding. The fact that the earth loses angular momentum as it slows should be fairly obvious. It should also be plain that increasing the distance between the moon and the earth will increase the angular momentum of the moon. But as the moon moves away, its orbital speed reduces, which should reduce its angular momentum. However according to Kepler’s law, the orbital speed is given by 1/√r, so the there is still a net increase in the angular momentum of the moon as it recedes. For example if the orbital radius increased fourfold; the orbital speed would halve, and the angular momentum (mass × velocity × radius) would double. The theory described, was developed by George Darwin in the late 19th century. It might seem surprising that the son of a biologist like Charles Darwin, would be able to think of such an ingenious idea; however 200 years previously, Newton had explained the more difficult concept of precession of the equinoxes, as being caused by gravitational pull on the equatorial bulge. So the creative input of the younger Darwin, was not as great as it might at first appear. Having explained the phenomena on the basis of conservation of angular momentum, it seems sensible to test the theory using measured data; to see if the angular momentum lost by the earth each year, does indeed equal that gained by the moon. The angular momentum of a rotating sphere, is given by the expression 2/5 MR²ω, where M= the mass, R its radius, and ω its rate of angular rotation. The earth’s rotation rate slows by 17 millionths of a second per year; the earth currently takes around 86,000 seconds to complete a revolution; so it loses 17 ÷ (1,000,000 × 86,000) = 17/86 billionths of its current angular momentum each year. So the angular momentum lost by the earth in a year = 2/5 MR²ω × 17/86 billionths = 79 trillionths × MR²ω, where M= the mass of the earth etc. The angular momentum of a moon in a circular orbit, can be described by MVR, but it is more convenient to replace V with Rω, so the expression becomes MR²ω. The orbital radius of the moon is 385,000 km; each year this increases by 2.8 cm; so expressed as a fraction the increase = 2.8 ÷ (385,000 × 100,000) = 73 trillionths. The angular momentum does not increase by that fraction, because the orbital speed reduces; in fact if you do the maths you find that the angular momentum will increase by half that amount = 36.5 trillionths. To compare the two values, we can express the mass of the moon as 1/81 that of the earth, its orbital radius as 60 times the earth’s radius, and its angular rotation as 1/27 (since it takes 27 days for the moon to circle the earth). 1/81 × 60² × 1/27 = 1.65. If we multiply 36.5 trillionth by 1.65, we get a gain of angular momentum for the moon of 60 trillionths. The loss of angular momentum of the earth, using the same units, was 79 trillionths. Therefore the moon has apparently only gained 60/79 of the angular momentum lost by the earth. However I calculated the angular momentum of the earth, on the basis that it is a sphere of uniform density, which is not the case. When I redid the calculations on the basis that the top layer of the earth, from 5700 km to 6400 km from the centre, had a density 8/11 of the earth’s average; that the next layer from 5700 km down to 3400 km had a density 9/11 the average; and the central core of radius 3400 km had a density of twice the average; the earth’s angular momentum was reduced by a factor of 0.828, and I found the moon had gained 60/ 65 of the angular momentum that the earth lost. As with most calculations in physics, there are many reasons why the two figures should not agree exactly. However not all of these reasons put together would lead to an error as great as 60/65, or a difference of 1/12. My opinion is that there is an error in the accepted mass distribution of the earth, or even the mass of the earth itself (though the ratio between the mass of the earth and moon is known for certain). The main reason why I think that is the case, is that I had the same problem trying to get my calculations of the earth’s equatorial bulge to fit the mass distribution shown here. In both cases it appears that a greater proportion of the earth’s mass lies closer to the centre, than is currently believed. 7 Responses to Why is the earth’s rotation slowing? Nice article. Doesn’t the Sun make a minor contribution to the tidal bulge? The sun’s tide raising force is about 2/5 that of the moon, so spring tides (when the sun and moon are working together) are about (1 + 2/5) larger than average, whilst neap tides (when the sun and moon are working against each other) are roughly (1 – 2/5) smaller than average. I have a page on the tides, but it does not discuss this in detail as far as I recall. Dear William, are you still working on this blog? I find your calculations most interesting. Two quick questions: is the slowing of the Earth not much faster? I thought we need a leap second every three years or so because the Earth slows by 23 milliseconds per day. The other question is: does not the outer core rotate in a different direction, and therefore take away angular momentum ? I have not added to this blog for years. Checking now it seems the distance the moon increases is 4 cm not 2.8 cm that I used, and the earth has slowed between 15 and 25 rather than the 17 millionths of a second each year I used. So my calculations could be well out. It is really hard to ever find reliable data, maybe the figures have been revised in recent years. It seems a leap second is added every approx 1000 days, which indicates a difference between the average current length of a solar day, and a theoretical day of 24 x 60 x 60 seconds where the second is defined by the oscillations of an atomic clock, of about 1 thousandth of a second a day. It is not determined by how the length of the day is currently changing. I doubt the outer core could possibly rotate in the opposite direction, though it might not necessarily rotate at exactly the same rate as the crust. I am glad you enjoyed my calculations. I am currently studying electromagnetism, but it is much harder to get my head around than Newtonian mechanics. Sir, I am somewhat confused by your article “Why is the Earth’s Rotation Slowing”. You refer to tidal bulges. By this do you mean the equatorial bulge caused by centrifugal force, or the ocean’s tidal bulge caused by the Moon? If this is the latter, then my understanding (and observation) is that the bulge is always aligned with the Moon, and can never be aligned as shown in your diagram, and would therefore never introduce a torque on the Earth. If however you mean the former, this is aligned around the equator, and would therefore present itself equally to the Moon at all times, causing no torque effects at all. Would you please clarify this point. It is the tidal bulge caused by the sun and moon which would make a non-spinning earth assume a lemon shape, as in the picture. The theory is that the spin of the earth drags the water round. That is generally accepted by physicists, it is not my idea. In reality the ocean tides are effectively waves reflecting off the land masses and their motion is very complicated. My picture does not represent reality; and there is no bulge which routinely points directly at the moon, or indeed in any other direction. Thank you for your reply. I have now read the next chapter, and my head is spinning. I am somewhat slow with maths, so will have re-read it a few times to grasp what is going on. A very interesting and informative piece of work.